WARNING: this is a giant post. the end. Thursday: After my CIT final (i totally passed the class by the way), we were on our way. We dropped Anne off in Orem, Utah and continued onward. 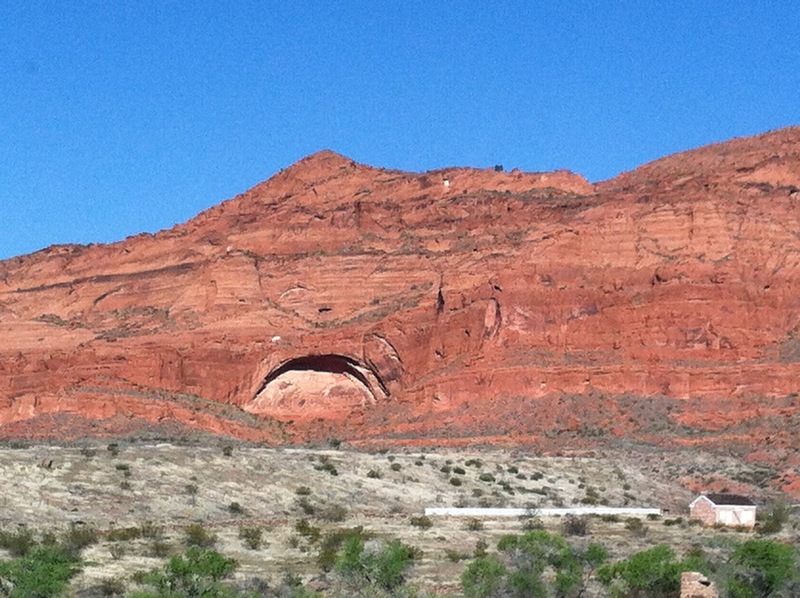 We had made a hotel reservation in Cedar City, Utah. A little ambitious. We were super tired, and we didn’t leave Rexburg until around 6. We rolled into Cedar City around 2am and got to our room. We crashed, but had to be up early. So our alarm went off at 7:30 and we went down for a quick breakfast. Funny story about Cedar City. We were repacking the car, and I had my wedding dress out, and these maids were walking by, saw it, and were smiling. They probably assumed that we were just married and spent our first night together at…A Knights Inn. haha. No thanks. Gave us a good laugh though. Friday: We drove through 5 states in less than 46 hours, and we finally made it to Grandma Silvija and Grandpa Rons house in sunny Vista, California right in time for dinner! Silvia and her friend Lura made pizzas. They delicious! We stayed and chatted for awhile, but then we were off to Jim & Michelles place. (Nathans dad and stepmom) I finally got to meet Michelle, and their kids Jordan and Maddie. We helped them move a little bit, but then headed back to Silvias to go to sleep. Saturday: We slept in, then were up and getting ready for the open house that evening. Everything was amazing! So many people helped so much and it all came together so beautifully. We made several runs to the rainforest. A friend of Silvija offered to do all the food for the open house. So we went to pick up up! And she lives literally in a rainforest! They have a bit of land, and have planted and created a beautiful place, complete with raised walkways. Nathan and I took a few minutes to walk around and explore. We forgot to get pictures of the receptions from Silvija. It was a lot of fun, and I got to meet a ton of Nathans family. After most everyone left. We went and changed out of our fancy clothes. The wedding dress was definitely more hot in April in California, than it was in December in Washington. But it was fun to get all dressed up again. We opened gifts with Silvija & Ron, Laima (Silvijas sister) and Lura. Luckily most of what we got was gift cards which was really nice since we had to drive back to Idaho. (we’re still working on thank you cards!) We went to bed after we sat around and chatted for awhile. Sunday: Easter! 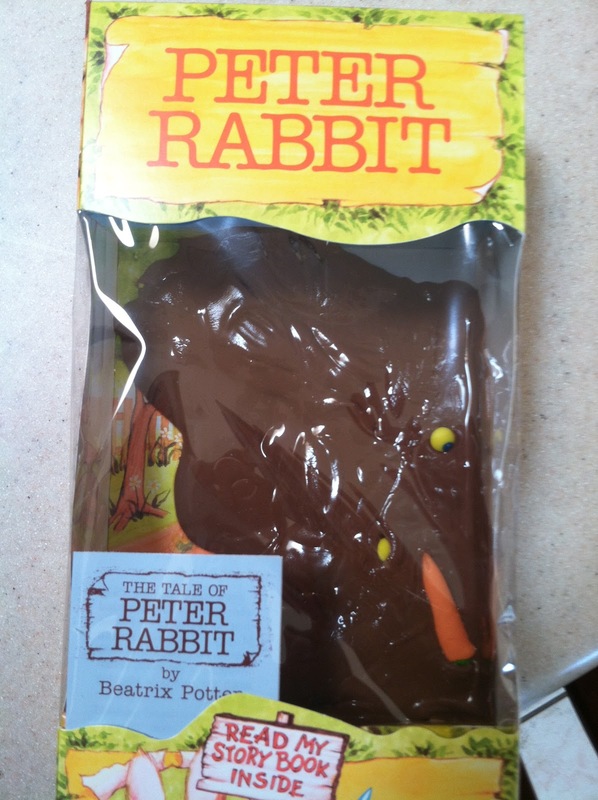 So I had thought ahead and got a hallow chocolate bunny for Nathan for Easter, because he likes to bite off their heads and pour milk inside. I even wrapped it so he wouldn’t know what it was. I forgot that California is warm (it was in the car). So when he opened his present…this is what was inside! We went to singles ward with Ron & Silvija, since Ron is in the Bishopric. It was fun though! After church we ate leftovers and relaxed. It was nice to just sit for a minute. I felt like we had been going since we got there. Later that evening we went over to Jim and Michelles to hang out. Both Jordan and Maddie are so funny! They’re all fun to be with. Monday: Nathan and I woke up and realized that we needed to be on the coaster in 22 minutes before it left for San Diego. It takes about 20 minutes to get to the station in Oceanside. So we rushed out the door and parked at the station, we sprinted across the parking lot, bought our tickets and ran to the train….just in time for it to take off without us. Whoops! We soon found out, that was not the train we wanted to be on, and that the 9:22 was cancelled. The next coaster wasn’t until 11. So we decided to walk down to the pier. We walked through Oceanside and down onto the pier. We decided to eat breakfast at Rubys which is at the end of the pier. AND! 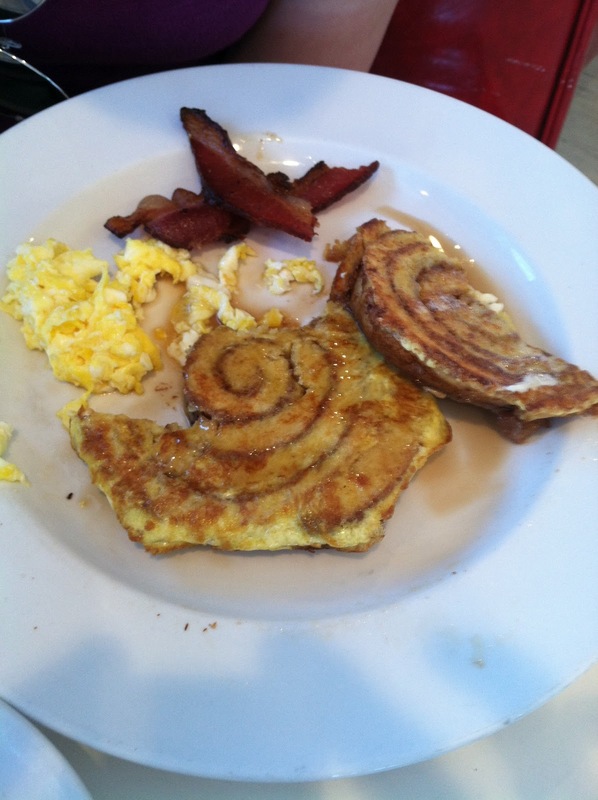 they have cinnamon roll french toast! So we split that for breakfast. You should be jealous! We made it to San Diego and to the ferry to Coronado island. We got ice-cream, and just walked around. We ended up buying, what they call a baja beach blanket! I don’t have a picture of it, but it’s like..purple, grey and white stripeys.They are made in Mexico and have really cool patterns. We decided on lunch at Peohe’s, where we had the best fish & chips our of lives. It was fun to walk around and check out all the cool gift shops and art galleries. We caught the ferry back to San Diego, and caught the coaster back to Oceanside. Nathan slept basically the whole way home (about an hour in total). I slept…mostly the whole way. When we got back to the house, Silvija took us out to dinner to an Argentine place! Nathan was so excited! They each got a steak, and I got a milanesa sandwich. We also each got a free empanada! Everything was really, really good. Back at the house, Nathan and I went swimming in their pool and sat in the jacuzzi. A nice and relaxing way to spend the evening. Tuesday: SIX FLAGS WITH JORDAN AND MADDIE!!!! It was so much fun! And thank you to Jim & Michelle for buying our tickets! We had such a good time. There were so many crazy roller coasters. Nathan would love to tell you all about them if you every want to know. Everything was high intensity, I know my mother would die. I ALMOST died. After Batman, I thought I was going to pass out. So we sat for a little while and drank some water. Then we were back at the rides. We tried to do funny faces for the cameras, but most of the time I just looked really special. We also got to meet Batman, Porky and Sylvester! ignore our white legs. Jordan & Maddie look like a different race! Holy cow! Six Flags was SO. MUCH. FUN. Oh, and I’m pretty sure we have the world record beat for fastest a funnel cake can be eaten. We bought two, and we sucked them down. We were all covered in powdered sugar. and happiness, definitely covered in happiness. I’m pretty sure my favorite ride was Goliath. Nathans favorite was X2. Which is another one that I almost barfed after. After six flags, we met up with Jim and dropped of Jordan and Maddie. Then Nathan and I headed over to Laimas house. Tim and Chris (her sons) took Nathan and I out to a late dinner at this delicious burger place. They were funny to watch interact. They hadn’t seen each other in about 3 years. We went back to Laimas house. I took a shower and went to bed. Nathan stayed up awhile and talked with his cousins. Wednesday: Lamia made us AWESOME crepes for breakfast! We got to stay and talk for awhile, but then we were off to the happiest place on earth! (Thank you Lenise and Ben for the tickets!!!) Yep, I finally made it to Disneyland, even though it was raining. I think the rain helped to make it even better! The longest wait we ever had was 35-40 minutes! I’ve heard horror stories of waiting for hours at Disneyland. But it was awesome. And it stopped raining about noon. The average wait was 15-20 minutes. We hit all the classic rides. I think my favorite was either Space Mountain, or Indiana Jones. Nathan’s were the Buzz Lightyear shooting ride, or Star Tours. Oh! The second time we were on Star Tours, I was chosen as the Rebel Spy! They showed my picture on the screen and everything! So cool!! Darth Vader was after me! haha. For lunch, right after Pirates of the Caribbean, we ate at the Blue Bayou! Oh my goodness, it was so good! We split a monte cristo sandwich. We watched the parade and we got to see a ton of disney characters. It was fun, I felt like a little kid, sitting on the curb smiling and waving. We met three characters throughout the day. Aladdin, Pluto and Mickey of course. it’s a pretzel! and it’s mickey! We had such a fun time. And as cheesy as it sounds, that place is truly magical. I felt like a little kid again, it was amazing. Before we left, we watched the Fantasmic show. It had explosions, and water spraying, fireworks, sword fights, dancing, singing, it was AWESOME! Before the show started we were just standing there waiting, and a lady behind us was like..”Hi, I don’t want to sound like a weirdo, but do you guys have a camera? You two look so cute with your hats, I just want you guys to have a picture of it.” haha. So we gave her our camera, and she took a picture. Thursday: We drove home after the fireworks and got back to Silvija and Rons around midnight. We went straight to bed and slept until about 11 the next morning. We were dead. We went swimming in the pool for our shower. Then Ron and Silvija took us out to lunch at THE BEST MEXICAN PLACE IN THE WORLD!! Acapulcos!!! Seriously. They do a lunch buffet, and they have a taco station, where they make their own tortillas. Oh my goodness. They were so delicious!! Also, we had flan for dessert. We stuffed ourselves then went back to the house. We decided to watch Up, since Silvija had never seen it. Ron worked on stuff outside, while we laid around inside. It was great!! We continued to lay around and talk until her book group was coming, and we were going to dinner with Jim & Michelle! We met Jim, Michelle, Jordan, Maddie and Dylan (Maddies bf) at PF Changs in Carlsbad. Dinner was so much fun. Basically I was laughing my head off the entire time. There was a special, were you get an appetizer to share, each get an entree, and then a mini dessert. Nathan and I got lettuce wraps, I got the Spicy Changs Chicken, and then I got a red velvet shooter. Yummy! Nathan ended up loosing a bet and having to eat a hot pepper from Jordans plate. Sucka!! The food was really good, I loved hanging out with everyone. We had a lot of fun. After dinner, Jim rode with us to go to see Nathans Uncle Albert. Uncle Albert has severe stomach cancer, and we were glad to see/meet him before he passes. He remembered Nathan, even though he wasn’t feeling too hot. We also got to see Uncle Jack. (Both are Jims brothers.) It was good to see everyone. 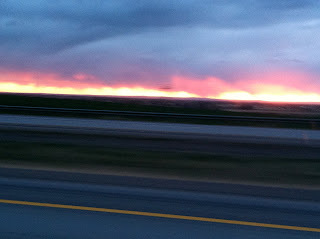 Friday: We were up early, and on the road. Silvija made us giant strawberry smoothies for the road. We drove literally all day long. We stopped in St. George to meet up with Nathans cousin Brian at In N Out. We met his son Beau, and his new girlfriend. Nathan and Brian had a great time catching up. After In N Out, Nathan and I walked across the street to Bed, Bath and Beyond. We decided to buy a juicer with some of our giftcards. Then we were back on the road again. We made it to Provo that night, and stayed with Danna and Josh. Saturday: I was able to be in Provo for Dannas baby shower! It was so much fun, and Sooo cute! Danna is having a baby girl, and she’s due in August. They threw the shower a little early because her sister in laws are both leaving for the summer. So it was fun to be able to go to that. After the shower, I picked up Nathan, then we went to Kneaders. Josh got us sandwiches to take on the drive home. (They were sooooooo good by the way. Thanks Josh!) We went back to Danna and Josh’s, Nathan took a quick shower. He had played a little frisbee with Marshall. Then we were on our way! We picked up Anne in Orem, and were headed for Rexburg. We also made a Costco stop, and filled our car to the brim. 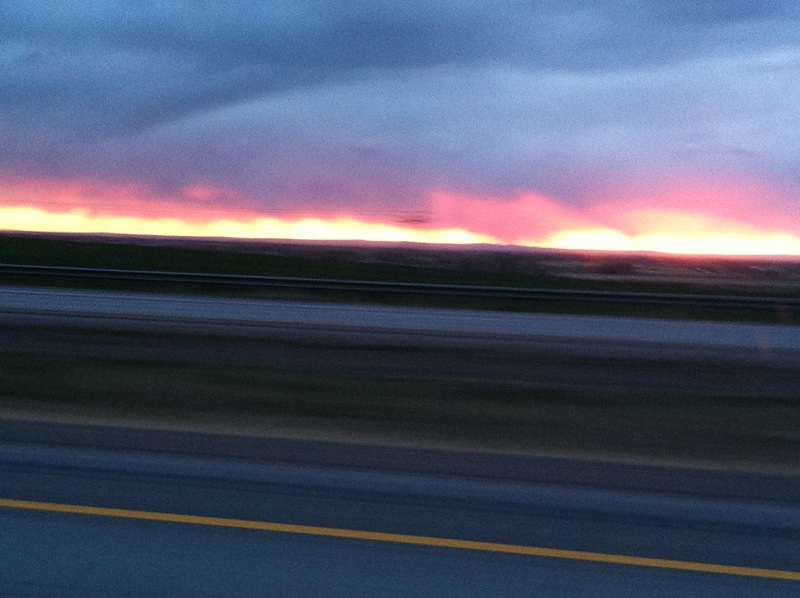 There were some crazy hail storms, and beautiful sunsets and we finally made it home. We had an amazing week, and have so many people to thank for it. Happy Sunday!